This is one of chess table part which has known as the buffer. This part is the strongest part to prop the table load. It has designed in round shapes to get a unique looks and polished in black with glossy touch. The black chess table looks so elegant with its single leg. Besides, you can also use it as one of your house furniture. You can put it in your dinning room, library, patio area and others house corner. 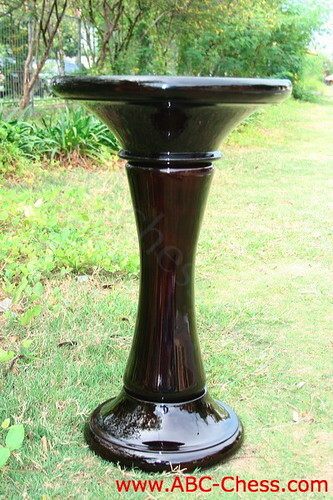 Black chess table has made of best quality of Teak wood and carved by profesional craftsman. This product is very durable for indoor and outdoor use, so you can use it at your patio area, garden, camp area, and other outdoor area. Get other chess table in different design and different colors. As chess manufacturer and house decoration furniture manufacturer, we have many choices for you. Shop now and order now!